Chippewa has been riding with America's bikers for over 50 years--long before some vintage motorcycles were even on the drawing board. The open road is luring more bikers than ever. Today's biker is looking for classic styling, high performance and unmatched quality--from their boots as well as their bikes. 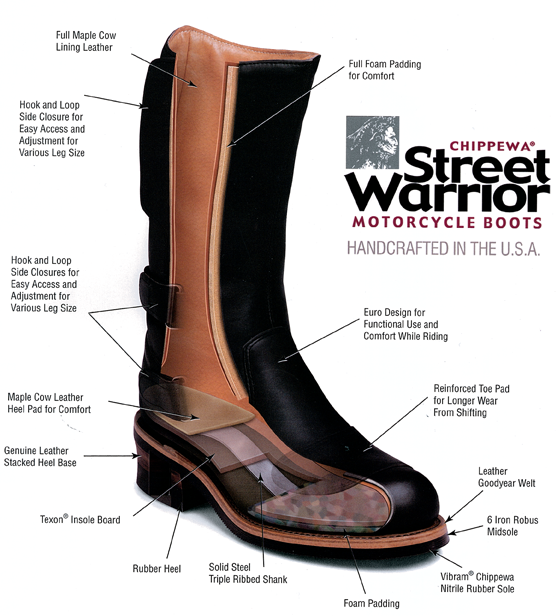 For over 50 years, authentic Chippewa Motorcycle Boots have been for today's biker. Premium Oiled Leathers - The best leather available. The oil helps keep your feet dryer. Vibram Chippewa Sole - The best sole in the industry. This particular sole is oil resistant and provides good traction due to its high surface contact area. Goodyear Welted Construction adds to boot durability, allowing multiple sole replacements, extending the life of the footwear. This process is Chippewa.s strength and forte. Not only does this construction allow you to repair and resole your boots, lateral support is second to none. Leather welts are very difficult to twist and this lateral support is especially important on uneven terrain. Quality Non-Tarnishable Hardware - To look as polished and shiny as your bike. Texon Insole - Wicks moisture away from the foot to keep it as dry as possible. The insole is also anti-microbial preventing bacteria growth in boots. Body Cushion Orthopedic Insole - Biomechanically engineered for maximum comfort and protection. Anti-microbial and machine washable. Fully leather lined and additional upper padding to provide maximum comfort.